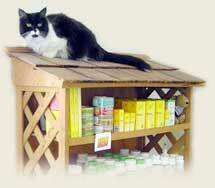 Welcome to the Natural Pet Store at HolisticVetPractice.com. We know that shopping for organic and natural products for our pets makes a real difference in their quality of life and our environment. We're proud to offer this wonderful assortment of supplies, toys, beds and specialty items. We invite you to browse through our store and shop with confidence. We welcome you to create an account with us or shop as a guest. Your shopping cart will be active until you leave the store. Rescue Animal Mp3 Project is dedicated to donating calming music to enrich the quality of life for abandoned animals in Animal Shelters. A portion of each purchase in this Rescue Animal Mp3 category will be donated to help continue our mission. Calm My Pet Products are fast acting, easy to use, safe organic veterinarian formulated products to help calm pets and restore healthy balance. *A portion of all sales benefit the Rescue Animal Mp3 Project-soothing animals in shelters!